Let’s face it, everyone likes to be good at something. If you can make your audience for your story or comic feel like experts of some kind, then they’re going to be more interested in the things you created. To use a related example, this is one reason why many modern mega-budget First-Person Shooter computer and video games are apparently a lot easier than old FPS games were. In the good old days, FPS games were fiendishly difficult and you had to put in years of FPS gaming practice to be good at games like “Doom II”, “Rise Of The Triad: Dark War” or “Duke Nukem 3D”. You had to start by playing on the lower diffculty settings and learning the “rules” of these games (and how to use them to your advantage) before gradually moving up to the “intermediate” difficulty settings. This is why these old games are still so much fun to play, even more than two decades after they were originally released. These days, of course, FPS games are apparently a lot easier. Your character’s health points regenerate frequently, the levels are often completely devoid of puzzles, your character always has more than enough weapons and there’s very little variety when it comes to the enemies that you fight. This is all done to allow the player to have the feeling of being an expert at playing FPS games without actually being an expert. But, this isn’t an article about computer and video games. 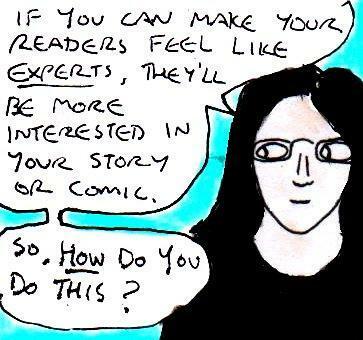 No, this is an article about how to make the readers of your story or comic feel like they’re experts at something. So, how do you do this? 1) Sneaky tips: One of the best ways to make your readers feel like experts is to occasionally show your narrator or one of your characters doing something that your readers don’t know how to do (whether it’s something realistic or something fantastical) and giving the audience (or the main character) some advice about how to do it. A good televised example of this is probably an American TV show called “Burn Notice”. This is a light-hearted thriller show about a fugitive spy called Michael Weston who often ends up solving problems for people. Throughout the show, Michael will often improvise spy gadgets or use clever spy techniques and these are almost always explained to the viewers via voice-overs. After watching a couple of episodes of the show, you almost feel like you could be a spy yourself. Almost. A word of warning here though, it’s usually not a good idea to give your audience realistic advice about how to do anything seriously dangerous and/or criminal. It’s also a good idea not to research any of this stuff online either. You can usually give the impression of giving this advice by either leaving things slightly vague (which gives the impression that your character knows what they’re talking about, even if you don’t) or, in some cases, just making it all up. This is also a good thing because it means that you won’t actually have to research some of this stuff and can just rely on your own imagination or things that you’ve seen in other books and movies (since, depending on where you live, researching certain things online may actually be illegal in and of itself). 2) World Details: There’s a good reason why both the science fiction and fantasy genres have much geekier fans than any other genres do. Because these genres are often set in entirely imagined worlds, there are often a lot of interesting background details that fans have to learn about in order to fully enjoy the story. For example, any “Star Trek: The Next Generation” fan will probably be able to tell you what a replicator is, what a warp core is (and what it’s powered by) and what the Prime Directive is. Any “Dune” fan will be able to tell you what spice melange is, what a mentat is (and why people use them) and how to distract a sandworm. Any “Song Of Ice And Fire” fan will be able to tell you what valyrian steel is, what a sept is and what the chorus of “The Bear And The Maiden Fair” sounds like. I’m sure you get the idea…. Usually, these details are introduced in a subtle way throughout the story – but, as well as adding atmosphere to the story, they also give the readers the experience of learning new things and becoming an expert in something. 3) Expert characters: Often, the easiest way to make your readers feel like experts is to just make some of your characters experts at something and to show them using their expertise in a variety of cool ways. If you do this, your audence gets to vicariously experience what it feels like to be an expert, without actually really learning anything. It allows the audience to imagine themseleves as that character or to imagine what hanging out with that character would be like. Don’t ask me why, but there’s something absolutely mesmerising and inspiring about seeing an expert at work. So, include expert characters in your story or comic. Although this is an article about sci-fi/fantasy storytelling and building a fanbase – I’m going to have to start by talking about TV shows for a while. This is because, at the time of writing, the most recent thing I’ve become almost obsessed with is an old TV show. So, it seemed like the best example to use when talking about how to make your audience more interested in your work. Anyway, at the the time of writing, I’m absolutely fascinated by an old sci-fi show from the 1990s called “Babylon 5“. In case you’ve never heard of it before, it’s a show about interplanetary politics on a space station – and, yes, this is actually a lot more interesting than it probably sounds. Just don’t judge it by the first episode alone. Like “Stargate SG-1”, “Star Trek: The Next Generation”, “Game Of Thrones” and a whole host of other sci-fi/fantasy TV shows, it’s very easy to geek out about “Bablyon 5”. And, well, I thought that I’d take a look at one reason why, in case it’s useful to you. One of the main reasons why shows like these attract such a large fanbase is because they’re often focused on things that are greater than any one individual character. Yes, the characters are usually extremely well-written, but they’re also often parts of various organisations or teams. To use an old example, Captain Kirk might have been the most recognisable character in the original “Star Trek” TV series from the 1960s. However, he’s also part of Starfleet and he has a large crew of other interesting characters (eg: Bones, Uhura, Chekhov, Scotty, Sulu etc…) that he works with. If the show had just been about Captain Kirk, then it probably wouldn’t have the fanbase that it does today. So, why do stories about organisations and/or teams often attract a larger fanbase than stories about individual characters? Well, it’s all to do with belonging. Whilst these kinds of stories often turn up in other genres (eg: detective shows such as “NCIS”), they’re most popular in the sci-fi and fantasy genres and there’s probably a good reason for this. According to a popular (and not entirely accurate) view of modern history – up until relatively recently, the people who have been ardent fans of sci-fi and/or fantasy were often… well… nerds and geeks (of one kind or another). They probably weren’t the most popular kids in school when they were younger. They probably weren’t people who really “fit in” or were really seen as “cool” by the mainstream standards of the time. In other words, they didn’t really feel that we belonged. Of course, this experience is hardly exclusive to nerds and geeks – there are many other valid reasons why someone might not feel that they “belong” to the culture, school, religion, social group etc… around them. And, well, sci-fi and fantasy stories that revolve around organisations, teams, noble houses etc… rather than individual characters give us a glimpse into an imagined world where people do belong to the things that they belong to and actually benefit from belonging to something. They show us things that we ourselves would actually want to belong to (eg: it’s no coincidence that Star Trek fans are famed for dressing up in Starfleet uniforms at conventions) and, because these stories revolve around an organisation rather than a character, it’s very easy to imagine ourselves as part of that organisation. In other words, these stories are so popular because they make us feel like we belong. 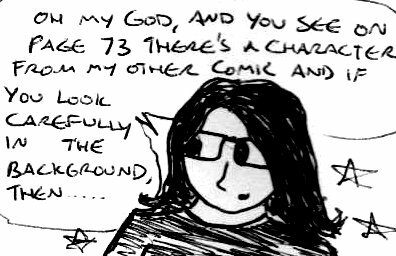 So, if you’re writing a sci-fi/fantasy story or comic, then it might be worth thinking about setting it within a group or organisation rather than focusing on a single character. Of course, this isn’t possible for literally every story – but it’s certainly a way of making your fans more interested. I’ve always liked “making of” features on DVDs, they’re essential to any artist or writer or film-maker. Or maybe they’re essential for any artist, writer or film-maker? Or maybe both? 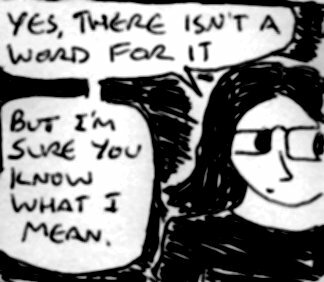 Anyway, earlier today, it seemed like a cool idea to write an article about how my “CRIT” comic and fiction series came into being. Every creative project starts out differently and has it’s own story behind it and I thought that it may be interesting to show “the story behind the story”, so to speak…. 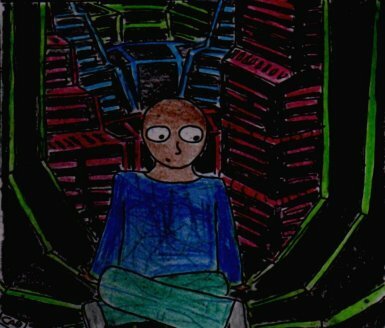 It all started one night in late November 2012 with a drawing called “Overpass”. I’d been watching the music video for “This Corrosion” by The Sisters of Mercy on Youtube and I really loved this atmosphere of this video. 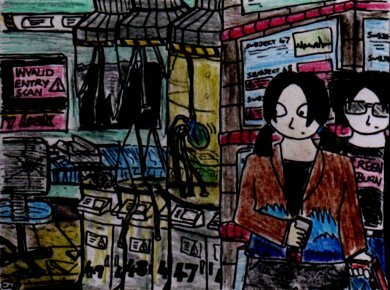 In fact, it kind of put me into a 1980s kind of mood and it made me think of “Blade Runner” too – so I decided to draw something which captured this exact feeling and ended up with a drawing called “Overpass”. Later on that night, I started daydreaming about a TV series I’d love to make if I could. 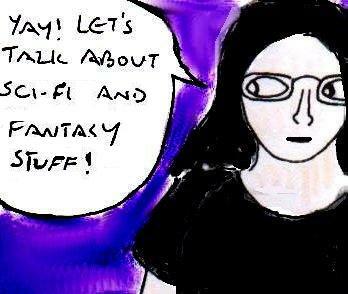 My original idea for it was: ” ‘Blade Runner’ + ‘NCIS’ + Goths = Win! “, to quote my notes at the time. The thing was, I just couldn’t get this idea for a TV series out of my mind and, the next night, I drew a storyboard illustration of the opening scene I’d described in my notes (although it isn’t particularly gruesome and is in black and white too, I decided to label it as “mature content” on DA since it’s basically a comic about someone being shot in the head). 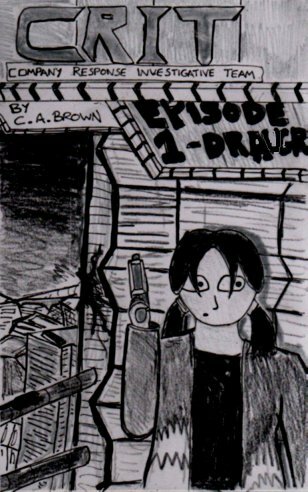 Later that night, I did another drawing based on the same idea called “A Heartless Crime” – it was kind of different to my original idea for the TV series and it kind of looked more like a scene from a more conventional cyberpunk comic/TV show/videogame than the gothic kind of TV show I’d originally envisaged. 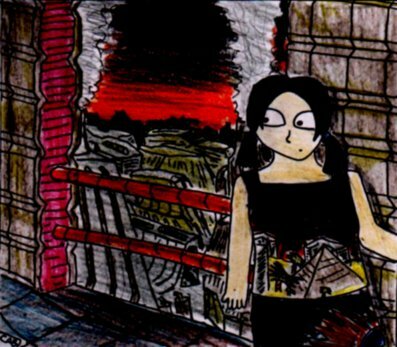 I decided to include the character from “Overpass” (who would later become Suzy) as well as a random goth guy (who would later become Jake). The thing was, this drawing seemed to have more of a story behind it than most of my drawings do and it seemed intriguing enough to make me want to draw more things related to this idea. The fact was, like with any good idea, I only had the vaguest and haziest idea about it when I started. This may not be the case with every writer or artist, but for me, finding a good creative idea can be like playing a 1990s stragegy game. When you start out, you can see a small part of the entire map, but most of it is covered by fog or darkness and the map only reveals itself gradually when you explore more and more of it. I had a general sense of some things, like what the world of this TV series would look like and what the main characters looked like, but I had no clue what their names were, what the backstory behind the series was or what it would even be called. But, driven by curiosity, I spent the next couple of weeks drawing lots of “concept art” (this was also kind of how “Damania” got started in spring 2011 and summer/autumn 2012 too) which kind of helped me to look at possible storylines for “episodes” of the show as well as work out what the ‘world’ of this untitled series would look like. I was fascinated. I could even vaguely imagine what the DVD boxset for the first series would look like. Somewhere along the way, I also decided to incorporate the two mega-corporations (Dextek and SYL-Corp) from an unpublished novella called “Ephemera” that I’d written in 2010 and then I decided to add a third mega-corporation which the main characters would work for. I eventually decided to call this corporation “Makerton – Riyadi” and it was kind of inspired by the “Weyland – Yutani Corporation” from The “Aliens” movies. If anyone is interested, all of my concept art can be found here – although it may contain spoilers for possible future “CRIT” storylines (you can see the beginnings of episodes 1,2,3 & 6 in this gallery). The only new addition to this gallery since I started making the comic is a short animation showing some of the backstory to the series. However, I started to get quite frustrated about the fact that I didn’t really have the knowledge or money to make a TV series and, by the time that the gold pencil I’d been using to colour in a lot of the backgrounds was only about an inch long, I felt completely worn out. I wanted to draw other things. So, I abandoned the idea and consigned it to the category of ‘great ideas which will never get made’ . 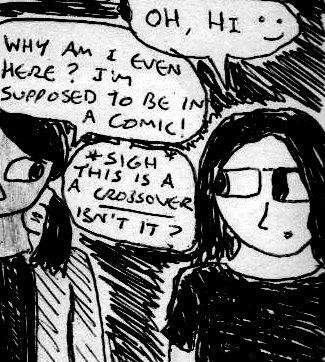 Then I got back into drawing comics again. 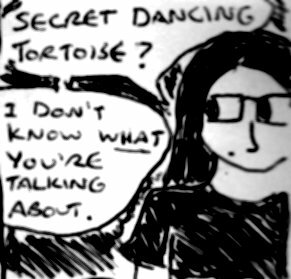 It started with “Damania” and then “Anachrony” and by about mid-December 2012, I thought that I’d have time to make another comic before Christmas. Of course, my untitled sci-fi series idea came into my mind and I looked at my concept art again and facepalmed a couple of times. It had been a comic all along! But, I still couldn’t think of a title for it. Eventually, distraught, I decided to distract myself with sarcastic reviews of old videogames on Youtube. Anyway, when I was watching a review of “Dino Crisis 2” (which I’d played in early-mid 2010), the reviewer made a sarcastic comment about the special forces unit which one of the main characters belonged to (called “T.R.A.T” ). For some reason, this name stuck in my mind and it wasn’t long before my mind had come up with something which sounded similar to it. And, after that, the rest is history….